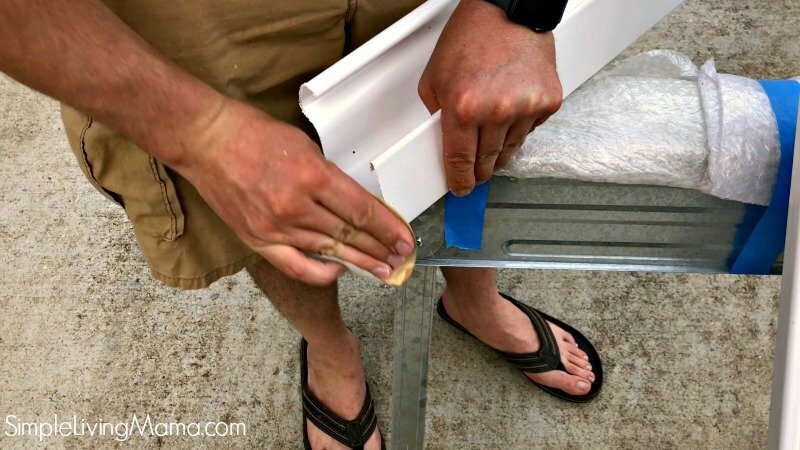 How To Make Rain Gutter Book Shelves – SO EASY! Our homeschool room is located in our dining room in this house. 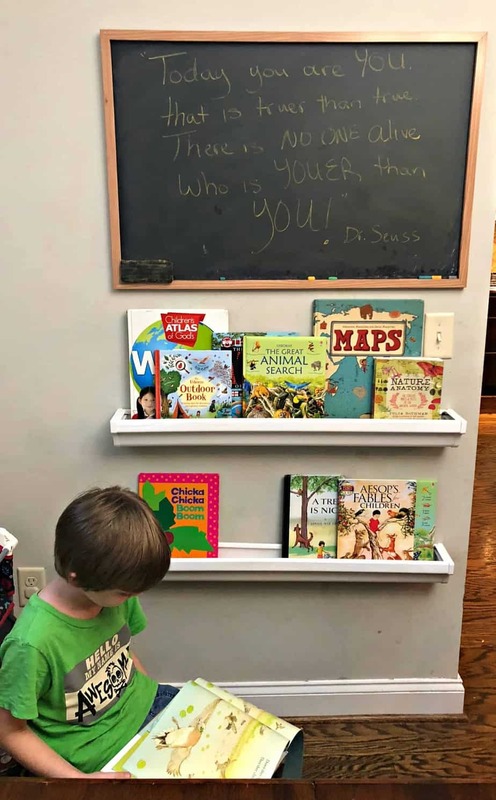 I love it because with so many littles it just makes the most sense to have our school room in a central location in our home. Our space is limited in the dining room, so we have to make it work for our large family home organization. We have a big table to accommodate all of us, a set of cube bookshelves, and then one small wall to work with. 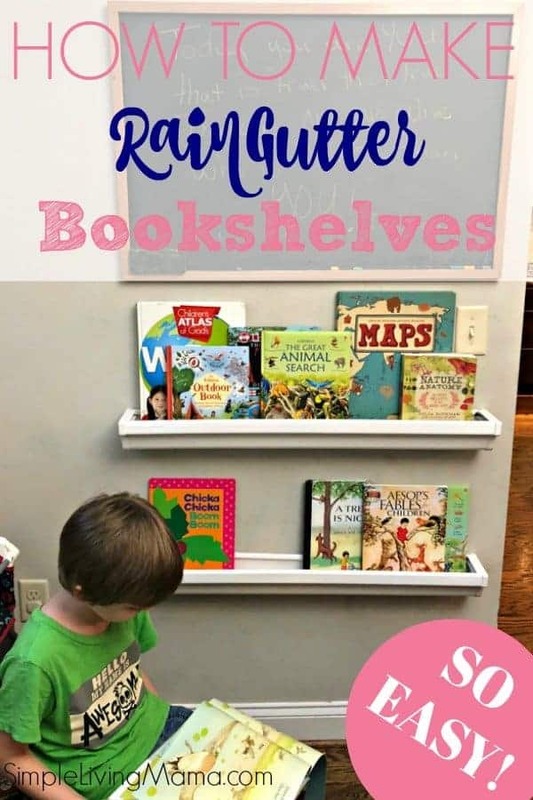 I needed some display shelves for the space, and when I saw DIY rain gutter bookshelves on Pinterest, I knew I wanted to try them! 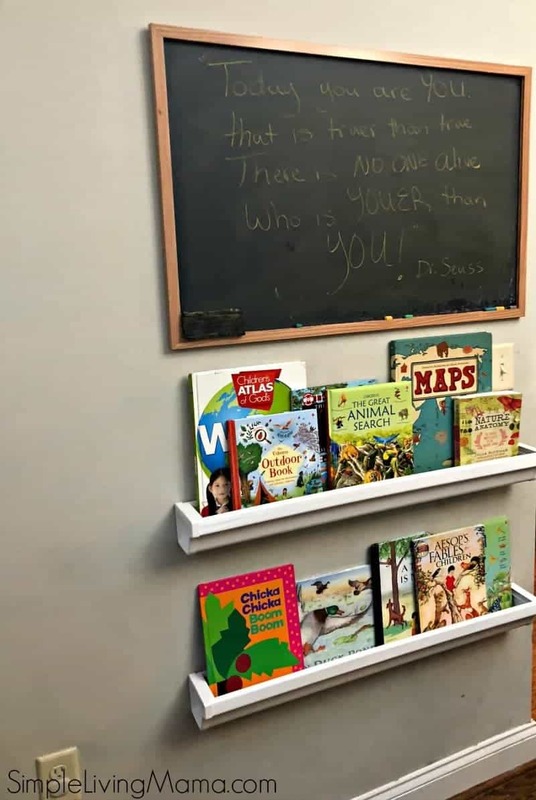 I have a small chalkboard on this wall and thought two rain gutter bookshelves below it would be just perfect for our current books. I wanted the top shelf to hold geography and nature study books, and the bottom shelf to hold preschool and science books that we are currently using. There is still some space to the left of this display, and I am looking for the perfect bookshelf to fit the space. 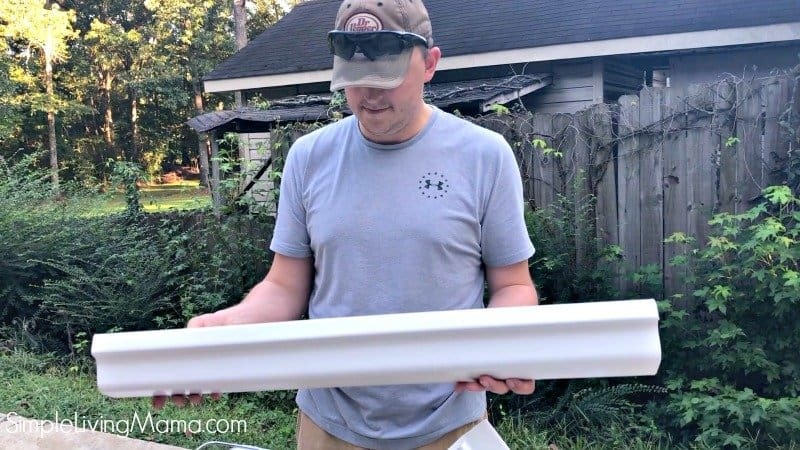 The first thing we did was go to Home Depot and purchase a 10 foot run of vinyl gutter. It was only $4.98. 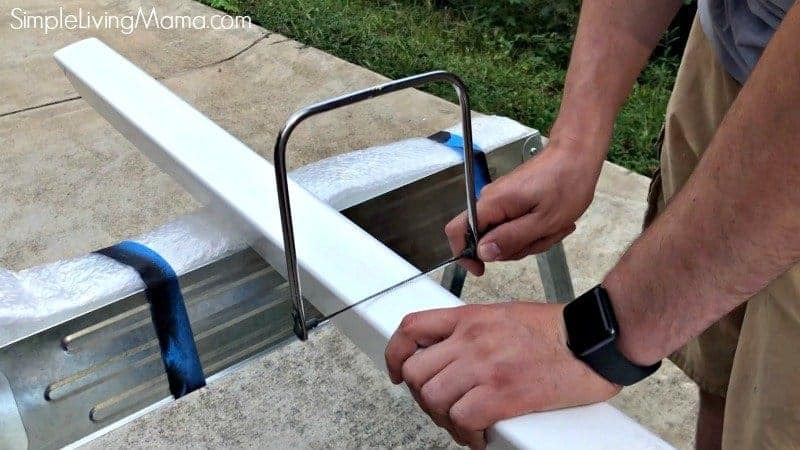 My husband was leaning toward getting an aluminum gutter, but I decided against it because the cost was more. He still says the aluminum would have looked nicer and been more sturdy. My husband then measured our space, and measured and marked the gutter. We could get three shelves out of this 10 foot run, so one of the leftover shelves will go in our boys’ room. He then used a coping saw and sawhorses to cut the shelves. Here’s a look at our bookshelf before sanding. He used 80 grit sandpaper to smooth the edges. We did purchase two sets of end caps. They were $8.98 each, so one set was more expensive than the entire gutter, but my husband felt that they were definitely needed to give the shelves more stability. 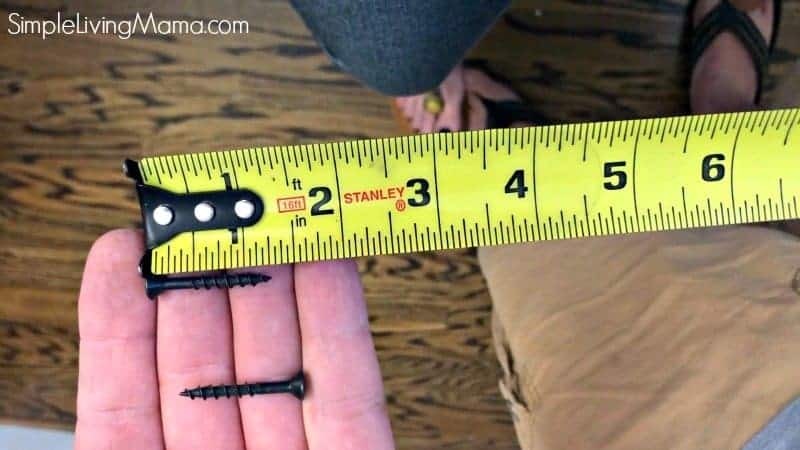 This is what size screws he used to screw the bookshelves into the wall. My husband found the studs in the wall and screwed the shelf THROUGH THE DOUBLED OVER EDGE directly into the studs. He wanted me to makes sure to tell you to screw through the thickest part of the gutter. 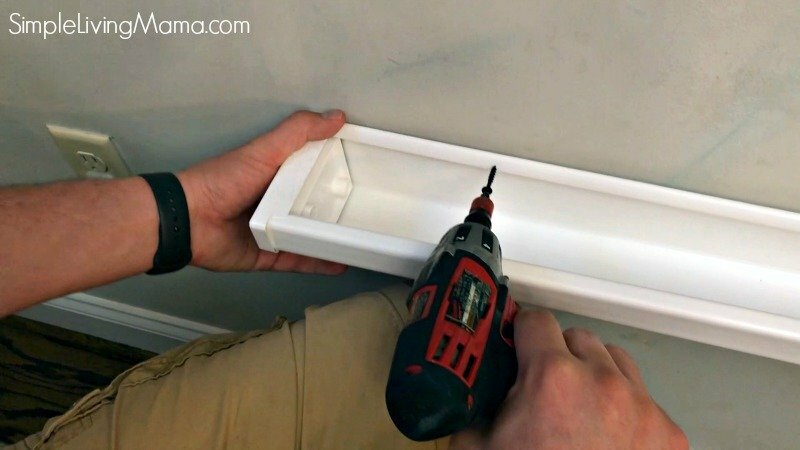 If you are not screwing the shelf directly into studs, you will need to use wall anchors so the shelves don’t pull out of the wall. Also, use a level to get your shelves straight. And that was it! 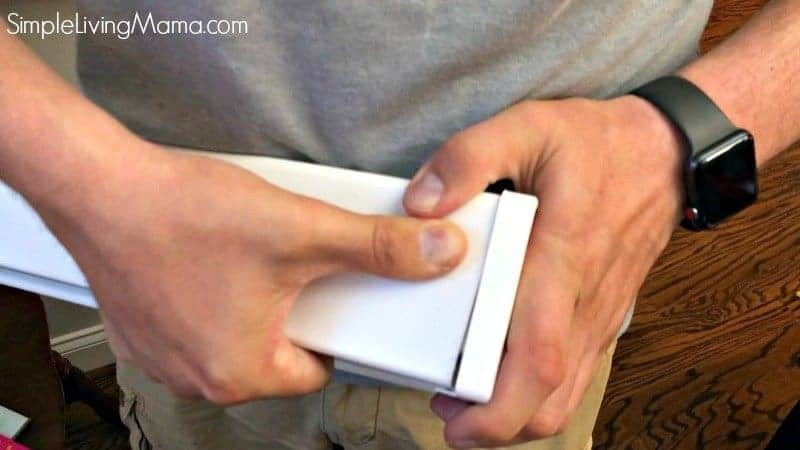 It was a very easy (especially with a handy husband) project and pretty inexpensive! Now I have a great place to keep our current homeschool books on display. 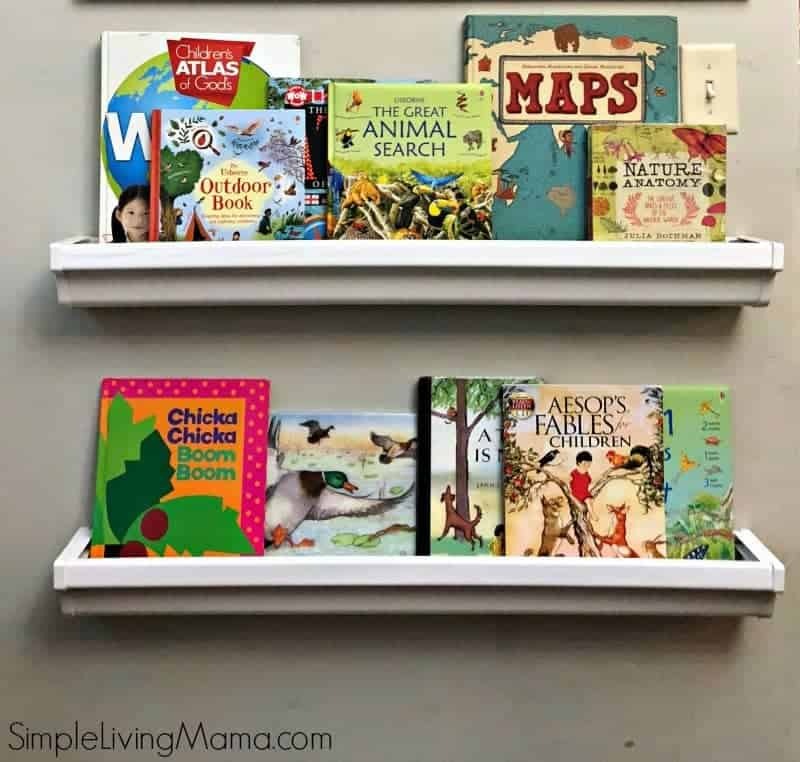 We do plan to add more rain gutter book shelves to our home, specifically for our boys. They have bunk beds and I figure each boy can have a bookshelf beside his bunk!